Have you thought about buying some marbles? 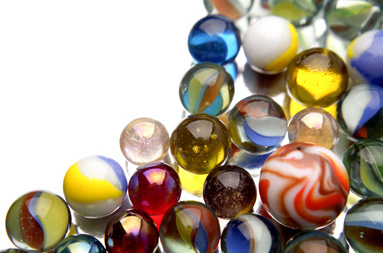 Jeffery Davis is a ham radio operator and one Saturday morning he tuned in and heard an older sounding man telling a listener about a thousand marbles. ‘ “Well, Tom it sure sound like you’re busy with your job,” he said. “I’m sure they pay you well, but it’s a shame you have to be away from home and your family so much. Hard to believe a young fellow should have to work sixty or seventy hours a week to make ends meet. Too bad you missed your daughters recital”. He continued, “Let me tell you something, Tom, something that has helped me keep a good perspective on my own priorities”. And that’s when he began to explain his theory of a “thousand marbles”. “You see, I sat down one day and did a little arithmetic,” he said. “The average person lives about seventy-five years. “Now then, I multiplied seventy-five times fifty-two and I came up with 3,900, which is the number of Saturdays that the average person has in their lifetime. Now stick with me, Tom; I’m getting to the important part”. “it took me until I was fifty-five years old to think about all this in any detail,” he went on “and by that time I had lived through over 2,800 Saturdays. I got to thinking that if I lived to be seventy-five, I only had about a thousand of them left to enjoy. “So I went to a toy store and bought every single marble they had. I ended up having to visit three more stores to round up a thousand marbles. I took them home and put them inside of a large, clear plastic container right here in the room next to my radios. Every Saturday since then, I have taken one marble out and thrown it away. “I found that watching the marbles diminish, I focused more on the really important things in life. There is nothing like watching your time here on earth run out to help get your priorities straight. “Now let me tell you one last thing before I sign off with you and take my lovely wife out for breakfast. This morning I took the very last marble out of the container. I figure that if I make it until next Saturday, then I have been given a little more extra time. And the one thing we can all use is a little more time. After the old man had signed off Jeffrey decided not to work on his radio that Saturday but spent the day with his wife and kids….. and bought some marbles.